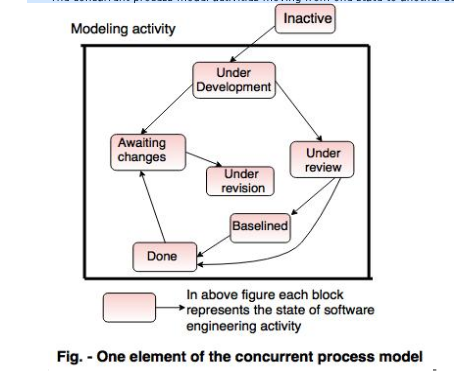 The concurrent development model is called as concurrent model. The communication activity has completed in the first iteration and exits in the awaiting changes state. The modeling activity completed its initial communication and then go to the underdevelopment state. If the customer specifies the change in the requirement, then the modeling activity moves from the under development state into the awaiting change state. This model is applicable to all types of software development processes. It is easy for understanding and use. It gives immediate feedback from testing. It provides an accurate picture of the current state of a project. It needs better communication between the team members. This may not be achieved all the time. It requires to remember the status of the different activities.